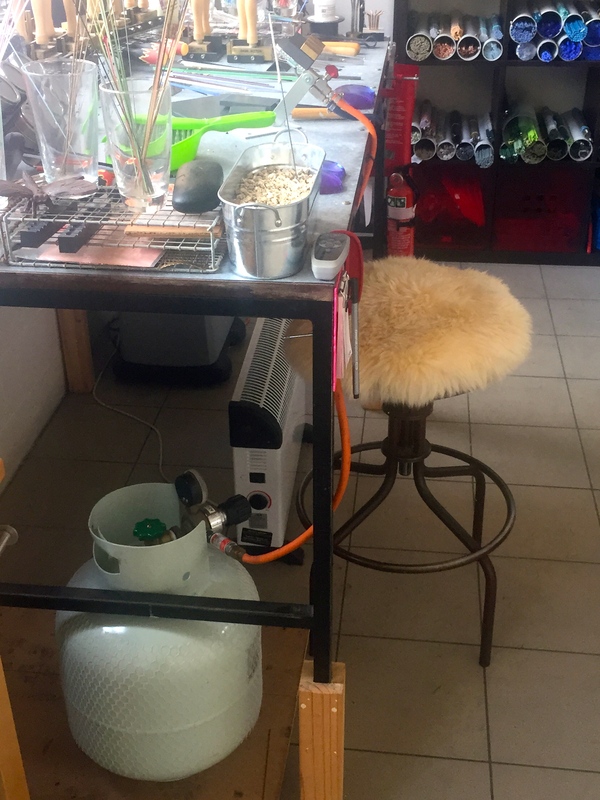 Studio Set Up – Part 3 discussed ergonomic workspaces and ventilation. It builds on the advice in part 1 and 2 about choosing the right space and torch for you. Now we discuss setting up a dual fuel torch In Part 4 of the Studio Set Up blogs. I’m going to discuss how to go about getting the torch connected to propane and oxygen. You may have the torch lying around waiting to be set up whilst you sort out some ventilation. You might have even purchased a beadmaking starter kit and have the torch set up and can’t figure out some of the problems with your flame, so you’re trying to find the answer online, and here you are. 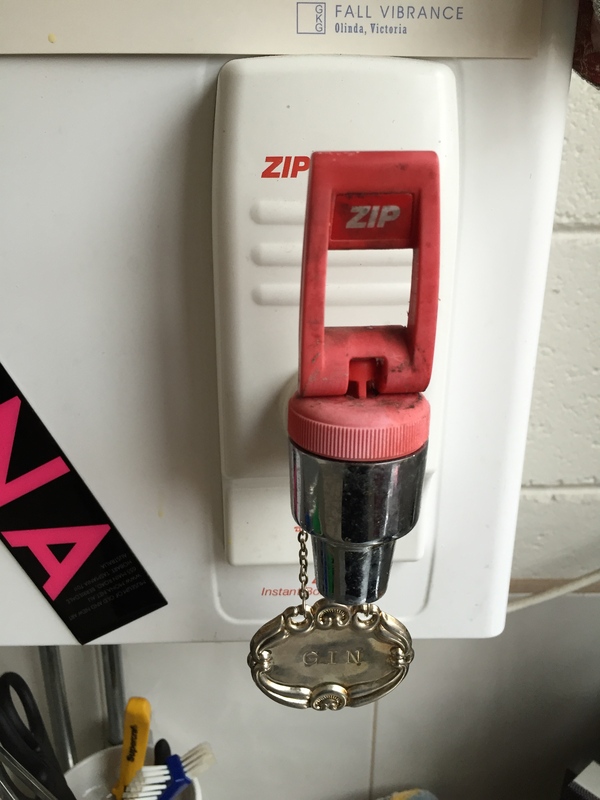 Hot water tap is secretly masquerading as a Gin dispenser in my studio. I know I need a few drinks after writing all that. Can’t imagine how you feel about reading it all and discovering there’s actually important and expensive safety stuff that needs to be done first. The Studio Set Up Blogs are cautious and may seem tedious or worse, discouraging, but the aim is for you to not make (expensive) mistakes with your set up. I spent hours searching for advice before I set up my first studio and I thought I was adequately prepared. I wasn’t at all. I did a lot of things backwards. I wish I hadn’t bought the tools and torch before seriously considering where I was going to actually do the lampworking. I would have saved myself a lot of time if I’d considered the room properly. I couldn’t lampwork for years because my husband has a serious asthma condition and the spare room was not suitable, even with ventilation. So there was my first studio, all set up and I couldn’t turn on the torch. It took a long time (more than three years) to find appropriate studio space close to home (I don’t have a garage or porch to modify). Whilst I was lamenting my stupid decision I reflected on some of the advice I was given. All of the advice was well intentioned but some of it was better suited to someone who had already been beadmaking for a while and not someone starting out. 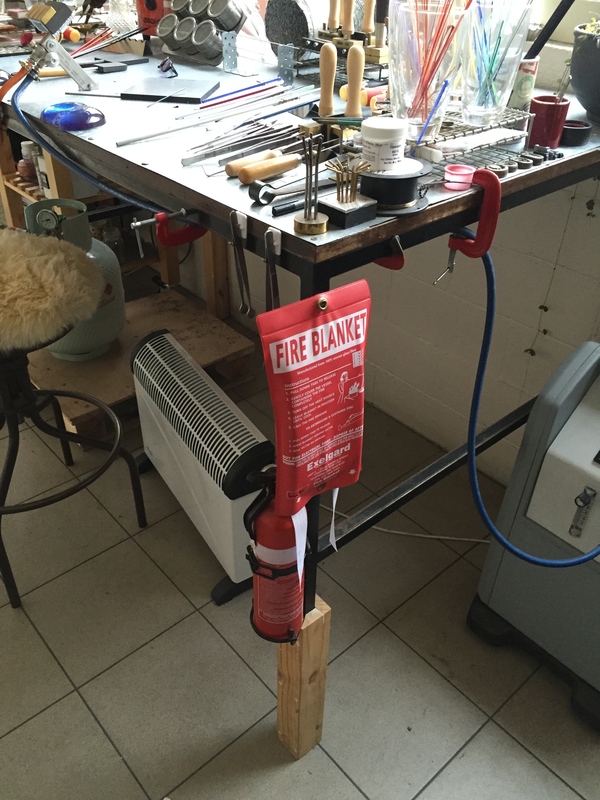 Fire blanket & foam extinguisher bolted to the righthand side in case of emergencies. Sadly, I noticed that I wasn’t able to tell the distinction between advice and golden rules when I was first learning about lampworking. I know now that if it sounds like you really should do it, it’s probably a golden rule and you should definitely do it first. And I didn’t, I got the torch and the glass and thought that all that other less exciting stuff wasn’t as important as it was because everyone was banging on about torches and glass. A lot of what you read online is opinionated advice (90% of this blog for instance) but the boring stuff makes up the golden rules (isn’t that always the way?) which is why I started with that information first. Now… finally, lets get that torch turned on. 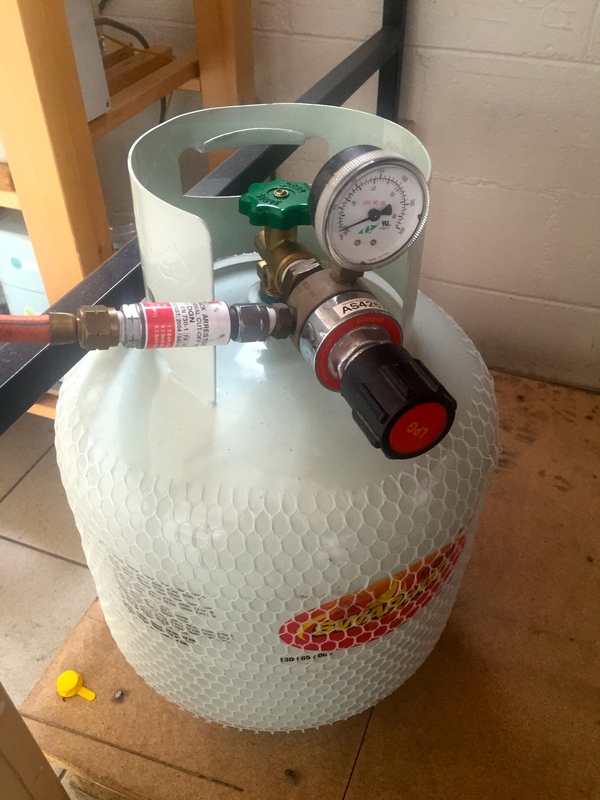 9kg LPG gas bottle (Swap’n’Go) fitted with propane regulator and flashback arrestor. In Australia, this is the easy part. You can get a 9kg LPG BBQ gas bottle refilled from some petrol stations or 7Eleven’s. In metro Victoria finding a service station that fills gas bottles up is a rarity, so I use Swap’n’Go. If you don’t want to buy your own gas bottle, you can participate in the “Swap’n’Go” program. Its a gas bottle exchange program, you bring in an empty bottle to a participating service station (or pay a $50.00 join up fee) and pick up a gas bottle. When that one is empty, return it and pick up a new filled bottle. Depending on your state or territory, filling your own 9kg gas bottle will set you back about $27.00AUD and a “Swap’N’Go” about $35.00 AUD. My 9kg gas bottle lasts about 60 hours, different torches use gas at different rates. It is also possible to get gas bottles delivered to your door depending on your participating Elgas branch. LPG Propane regulator showing the point of flow I use for my Minor Burner. This is a bit higher than where I usually run it. 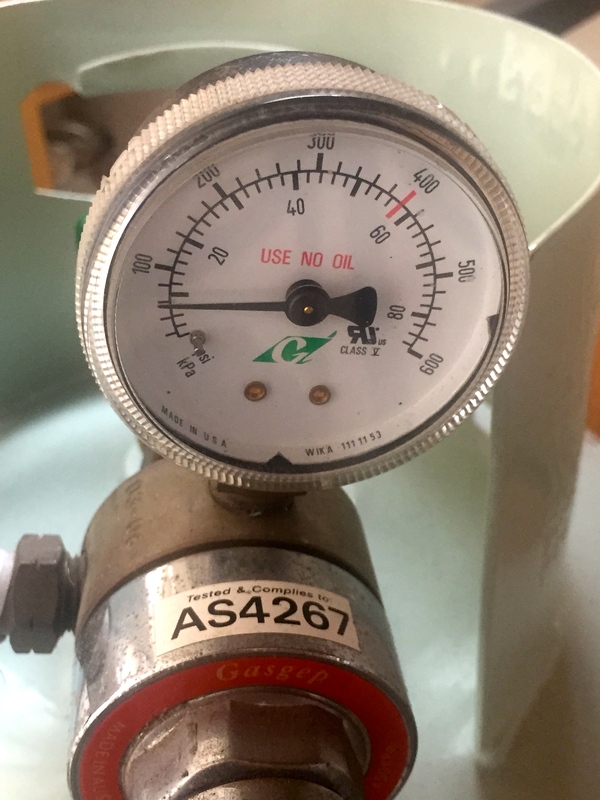 Gas bottles require a regulator with a pressure dial for precise flow rate indication. There are lots of regulators on the market, don’t get the flat saucer type they’re unsuitable. I tried to remember where I bought my regulator from and I couldn’t, instead I’ve linked a site that sells a regulator that is suitable for Australian and New Zealand residents, you shouldn’t spend more than $100.00AUD to get one. For most surface mix torches you want to set that dial to 2.5 – 3Kpa. Yes, it sounds low, but that’s where it has to be, much higher and you will change the flame chemistry to a reducing flame. This means you will radically change the colour of some types of glass when put in the flame. Sometimes a reduction flame is good, but you don’t want that all the time. Your aim is for a neutral propane and oxygen mix. 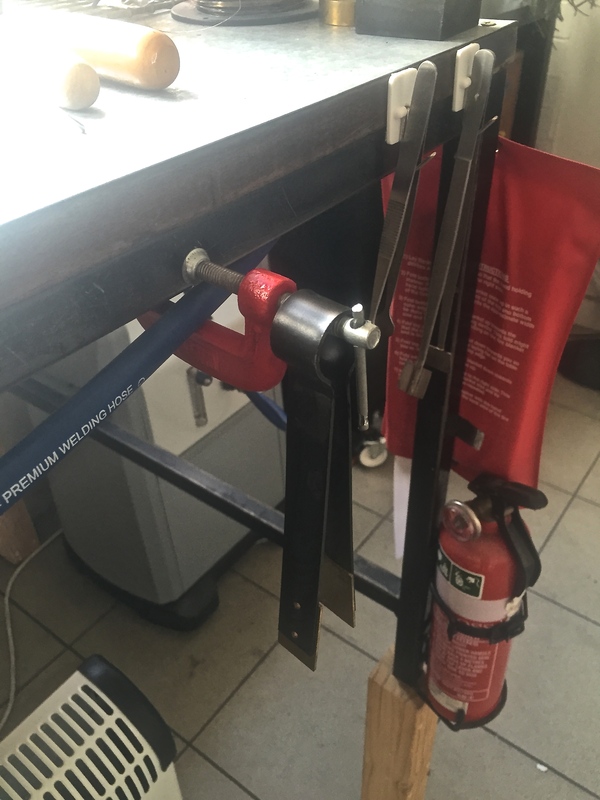 You will also need hoses and clamps to connect your torch and gas bottle. Each country has a different colour coding system for gas and oxygen hoses. Your country might have red hoses for gas and green for oxygen. 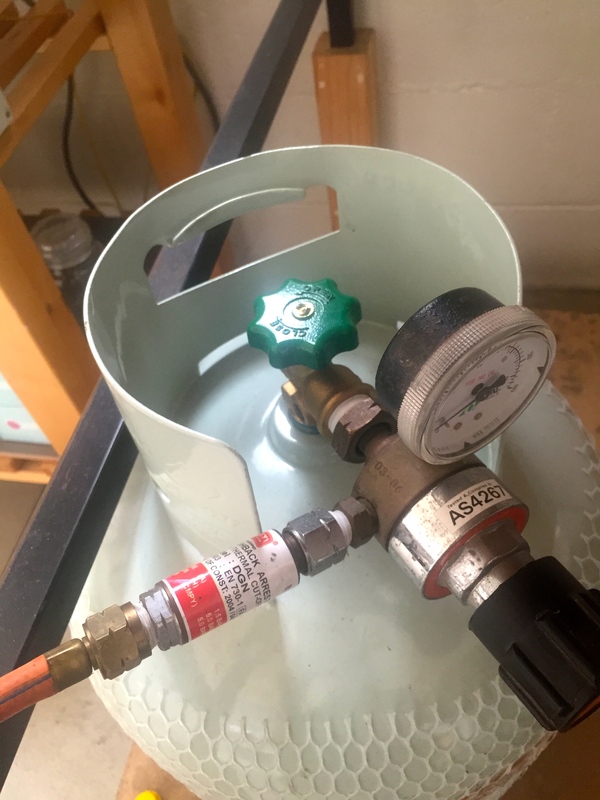 9kg LPG gas bottle showing the connection between Flashback Arrestor and Propane regulator and then the connection between regulator and bottle. I use white plumbers tape to create a tight seal. 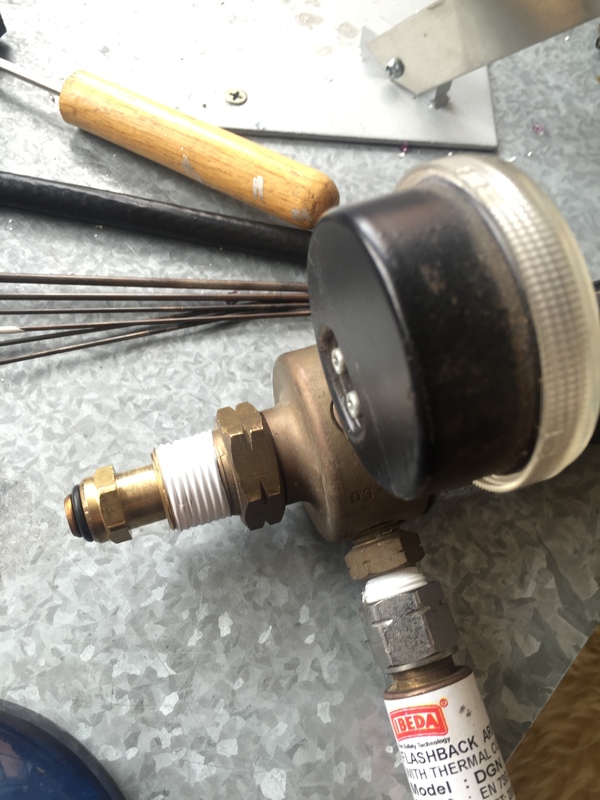 It is best to get hose with fittings suitable for a regulator at one end and unclamped and unfitted at the other end (so you can clamp it yourself to your torch, which has a much narrower fitting than gas bottles). Get the minimum amount of hose needed. Hose beyond 3.5 metres loses pressure or picks up impurities along the way, it’s not counteracted by increasing the pressure either. You can always buy 5 metres of hose from a camping or hardware store with the fittings for a propane regulator attached if buying online doesn’t suit you (hose for gas is about $12.95 a metre usually) and then cut it to size. The connection to the Minor Burner, showing the orange hose for LPG and the blue hose for Oxygen. I’ve used white plumbers tape for a strong seal before clamping the hose to the torch fittings. When you get the hose with the regulator fitting, attach that end to your gas bottle regulator first (this stops you from cutting the wrong end off). Then run the hose up to your torch and leave some slack. If the hose is too tight the gas will not flow properly. Cut down the hose to length and clamp it to your port on your torch tightly. The clamps you need can be found in the plumbing section of hardware stores and automotive parts stockists. They’re about .90 cents each. If you have a surface mix torch you do not need flashback arrestors for LPG bottles. I have one because it’s required under my rental agreement. BOC in Australia, which supplies the welding industry has them if you need one. In America, they are most commonly sold in hardware stores. Different torches have different connections between torch and hose, if you are unsure always check with the manufacturer. Keep an eye on your hose, make sure no cracks develop in it. Cracks can happen due to kinking (or tautness), extreme heat and cold exposure or gas left too long in the hose. To test for tight connections, fill a spray bottle with soap and water and spray onto the connection, turn on the gas tap lightly. If the soap bubbles at the connection point, you have a weak connection to the gas bottle. Tighten the clamps, or in worst cases, purchase new hose and new clamps. Keep testing to ensure your connections are secure. Gas sinks and displaces oxygen, it moves around spreading outward and very slowly rises to fill a room. Therefore small children and animals and anyone sleeping nearby will be first affected by gas leaks. 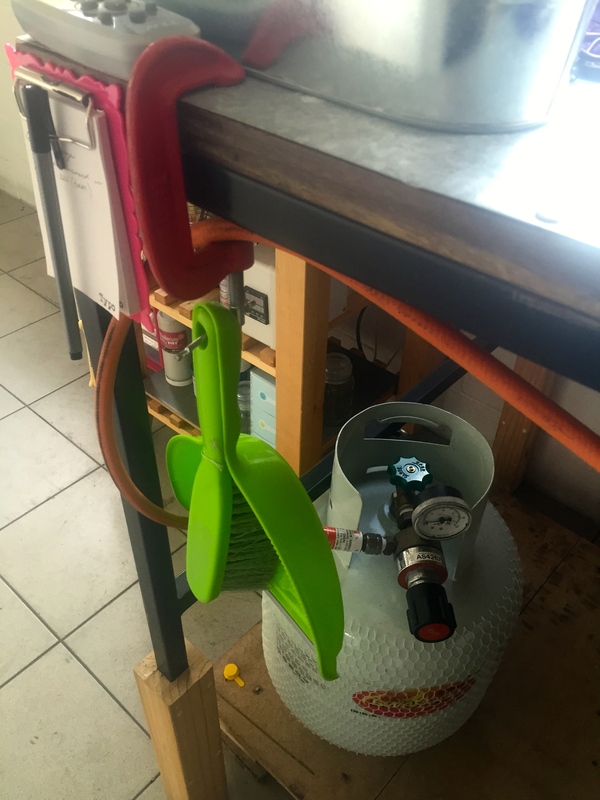 Cheap C Clamps double as a convenient place to hang things, keep hose neatly out of the way and will keep your aluminium sheet in place. (Notice how the hose is not slack, but not taut either). To keep hose out of the way, I used C clamps to tuck it up next to the bench without pinching the pipe. I wasn’t fussy, I just bought the cheapest types I could get. Clamps keep your hose not taut and not slack, if hose is too slack gas will rest in the dips. If hose is too taut the strain and pressure will cause cracks. Many lampworkers “bleed” their hoses so that no gas or oxygen rests in the hose. I do this more often than not, once my torch is turned off, I reopen the tabs on my torch and let the gas and air escape (keep your ventilation running) then close them back up once the hose has been “bled”. You’ll know when all the gas and oxygen has escaped because the hissing will stop. This does not damage the ports on your torch. That’s it, the gas is done. For the most part you can get everything you need from a hardware store or even a camping store. Do not skimp on the regulator, you definitely need one with an accurate dial on it because it must hold the pressure at a tiny 2.5kpa. The other fuel source for your dual fuel torch is oxygen and this is a little more tedious. Australia has a lot of rules about who gets their hands on bottled fuels other than LPG. You can purchase oxygen in bottles or you can buy an oxygen concentrator and produce an endless supply of oxygen. If you are hiring bottles you will need an oxygen regulator and a flashback arrestor. Some oxygen regulators have flashback protection built in. When you purchase your regulator ask for the matching flashback arrestor that goes with it. If you purchase an oxygen concentrator (oxycon), you don’t need a regulator or arrestor. Oxycons have a gauge on them to control pressure and flow. Oxycons are used very frequently in the medical industry, so you can often find 5lpm refurbished units around. Models will vary via brand, but all models have a gauge that shows pressure, some have a gauge to show purity levels and all will have a dial to control pressure (and some have a dial for purity as well). What is most important about choosing an oxycon is how many litres per minute (lpm) it produces. You also need to know how much lpm your torch needs to operate properly. As a general rule of thumb lower end dual fuel torches, those with 7 ports will be fine to operate on a 5lpm. The more ports a torch has, the more LPM it will require to run. The next size up is 14 ports and you will need an 8 – 10lpm oxycon. Some torches have an “inner fire” of 7 ports and an “outer fire” of 14 ports, those definitely need a 15 to 20lpm oxycon or two 10-15lpm oxycon’s “Y’ed” together (that means the oxycons are connected together at the same pressure to run the torch sufficiently). 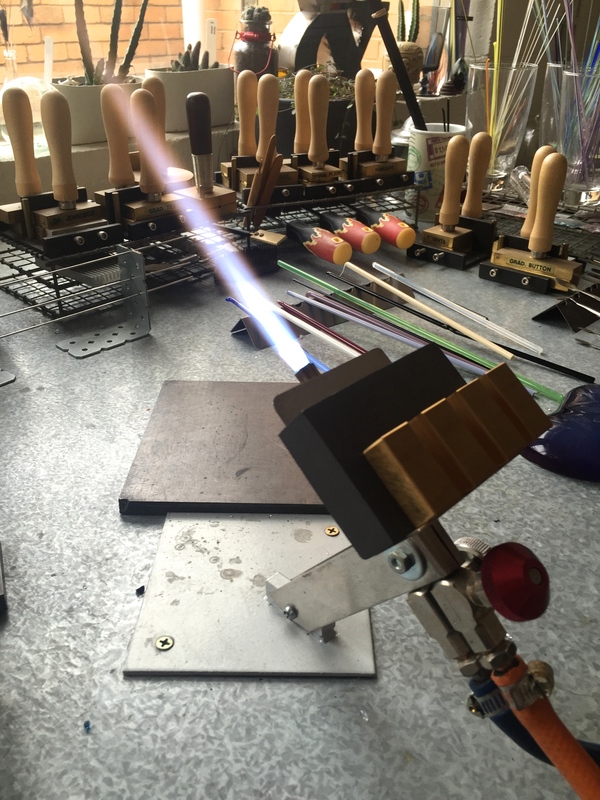 Larger torches for borosilicate are much bigger again, 32 ports and up and definitely require “Y” connections to concentrators. Blue hose for oxygen (you can see the oxycon in the background of the photo) This hose is clamped up in several places. Notice the hose is labelled “welding hose”. If it’s blue and it says that, you can still use it. For instance, a Minor Bench Burner requires a minimum of 5lpm to run. I have my Minor running on a 10lpm, but it maxes out at around 8lpm, so obviously a 10lpm oxycon is overkill for a Minor Burner. Oxycon’s are sold in 5lpm, 8lpm, 10lpm, 15lpm and 20lpm. The larger the volume it produces the more expensive the units get and the harder they are to find in Australia. I bought my first 5lpm oxycon in 2006 second hand for $1500 from a company that refurbished medical devices. My second unit purchased new in 2011 was $2100. Oxycon’s were stupidly expensive ten years ago, but thankfully they have come down in price considerably. If you’re in the US, a 5lpm oxycon will set you back about $500 and an 8lpm or 10lpm around the $1200 mark. In Australia oxygen hoses are blue and start at around $9.00 a metre. In some countries oxygen hoses are green, if you’re using green hose in Australia it is fine. Can cost between $60.00 and $90.00 depending on size for each refill or swap over. You may need to swap them over every 45 to 60 hours of usage depending on your torch and what size bottle purchased. Can be hard to procure from suppliers or may need a permit to use in a residential area (depending on council regulations). Need to be chained up and secure at all times. Have a naturally high litre per minute (LPM) rate. Are a clean, almost pure source of oxygen. Big initial start up price, but did I mention the free oxygen? Also, they tend to creep people out the first time they run (they sound like a machine breathing or can give people flashback memories of sick relatives). You need to keep oxycon’s clean inside (dust free) and away from moisture or moist environments. (They all come with instructions on how to look after them and it’s very simple). Need to have the pressure dial at a rate consistent with what your torch is using up, too much pressure can cause problems with your flame. This photo shows you how close the LPG bottle in relation to my torch. Its under the desk to prevent any hot glass disasters. The white thing on the other side is my heater because it’s nasty cold in winter. If you know you’re going to be flameworking for years to come, put aside money to invest in an oxycon. Always get one that suits your torch, if you know you will be upgrading your torch in the not very distant future; purchase a slightly bigger size (go a 10lpm instead of an 8lpm) and just turn the oxycon down with your lower end torch. 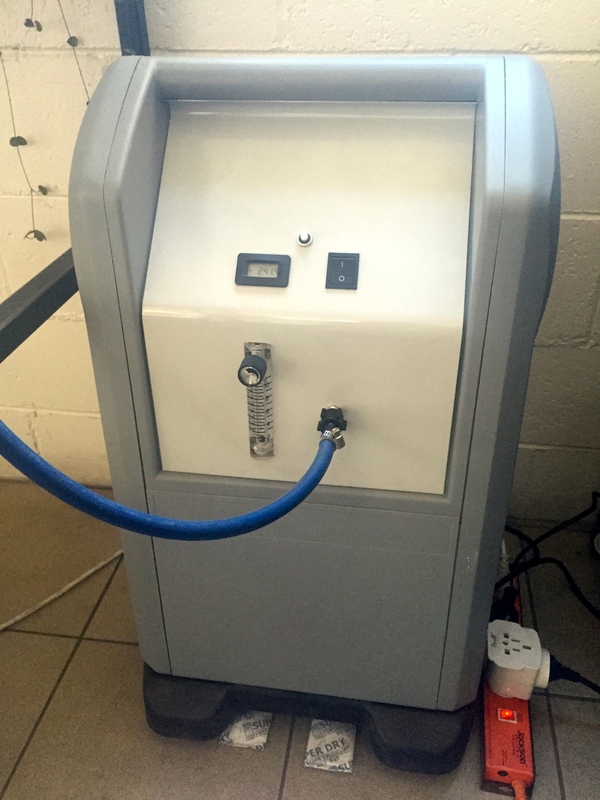 After your extraction unit an oxycon is your next biggest purchase on your list of very important things to buy. If you didn’t buy a desk or chair then the expected outlay (say you go a mid range ventilation unit and not an industrial grade extraction unit) will be around $2700-$3000AUD. ($1000 ventilation including associated costs – such as electricians fees, $1500-1900 Oxycon, $250 Minor Bench Burner). Throw in some glass and a few basic tools and you’re easily hitting the $3000 mark to begin your hobby if you live in Australia or New Zealand. The good news is, if you’re from the United States and some parts of Europe you can set up for about $1000 less. I bet that Hot Head torch and your garage is looking like a pretty good option after you’ve had a look at some of the expected costs of a dual fuel torch. A small note about oxycons and moisture, I put moisture absorbing pads (the kind with the little beads in them) at the base of my oxycon to draw out any moisture. Moisture will destroy an oxygen concentrator very quickly (as will extremely dusty environments) If you’re living in humid climates, I recommend you get the moisture absorbing buckets that hardware and supermarkets sell in the laundry aisle and keep that near your oxycon. Also, keep your oxycon out of direct sunlight and remember to clean the filter on the back of your unit. Every few years have your oxycon serviced, it is astonishing how much dust they can pick up. Dust and moisture is the number one killer of oxycons. If you’re not going to be using the unit for a while due to holidays, cover it in a drop cloth (not plastic). If your oxycon is causing your flame to “breathe”, then there are a few possible causes. My torch does this when I have the oxycon turned up to high (its producing more oxygen than my torch can use up). The other reason is that the sieves inside your oxycon could be blocked or nearing blockage. If this “breathing thing” is happening to you, don’t stress out. Play with the settings on your oxycon before you call in a service report. Once the hoses are all connected and fitted properly, you can go ahead and start up your torch, but first you need to POOP. No, so not what you’re thinking. (Credit for this acronym goes to Pauline Delaney). When you start up a torch you want to turn the propane on at the LPG bottle. (keep your fingers under the nozzle). Behold, the marvel of fire. Neutral flame on the Nortel Minor Bench Burner. This photo has been colour altered slightly, so you can see the distinct parts of the flame. Torch lit with fuel number 1 (propane)! If it’s flaming all over the place, turn the red dial down a little, if it’s barely a flame, turn it up a little. Turn your oxygen on at the oxycon or twist open bottle taps. Twist open the oxygen tap on your torch and adjust the flame for a neutral setting. Don’t worry if it doesn’t look right, my minor takes about two minutes for the flame to set up correctly. If you hear a rushing or wooshing sound this means your oxygen is up too high, turn it down a little. The candles (the bright little flames at the very tip of your torch) should be blue and sharp, if they look long and yellow, you have too much gas. Neutral flame on the Minor Burner. If you look closely at the flame you will see the three distinct working areas. To turn off the torch, follow the acronym. Turn off your oxygen bottle tap or oxycon then twist closed the dial at the torch. Then turn off your propane at the bottle and twist closed the dial at the torch. Until you remember the order, get a sticky note and write POOP on it to remind you of the order. This order will reduce the chances of flashback. Some people like to bleed their gas and oxygen lines, if you’re torching every day this isn’t necessary, if you are not it’s a handy thing to do as it lengthens the lifespan of your hose. 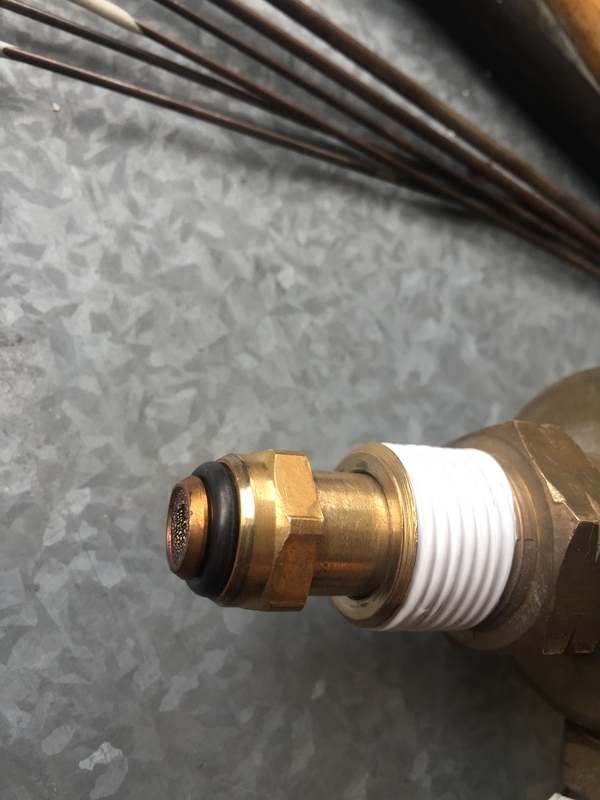 To bleed lines open the valves on your torch a little after you have turned everything off and let the air and excess propane escape for a few seconds (remember to keep your ventilation going, gas will sink and if there is a pilot light or candles burning nearby it could be an ignition point.) Gas sitting in hoses too long will develop an oily goop that will be forced through the hose and into your torch (which means your torch won’t work properly), so if you’re not torching regularly bleed your hoses. Connection between gas bottle and regulator. The tape is 5 months old and is still in good condition. I’ve unwound a section so you can see how it “frays”. 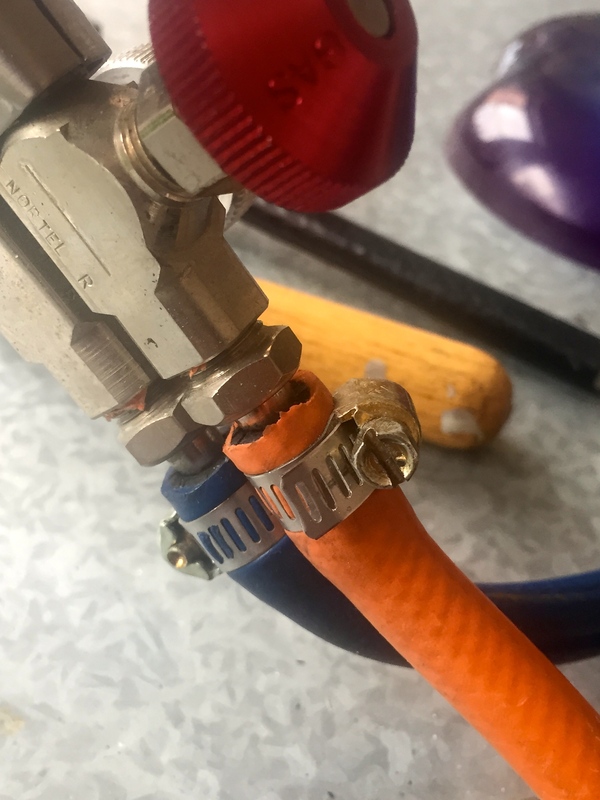 I have mentioned in this article and elsewhere in forums that I use plumber’s tape on the connections between my hoses, gas bottle and oxygen concentrator and I am met with some abject horror by some artists. I think it’s important that I explain a little bit about plumber’s tape because there is a correct way to apply it to your fittings. Firstly, why you would want to use tape on your connections. Plumber’s tape creates a strong grip on the threads of your gas or oxygen bottle and your flashback arrestors and regulators. It stops leaks because it helps create a tighter seal and makes unscrewing and screwing the connections together easier, you’re also less likely to wear out the threads on your connections. This is what frayed tape looks like, with some debris from a gas bottle that was sitting outside. If you start to see “threads” of tape hanging from your connection, it’s time to renew it. 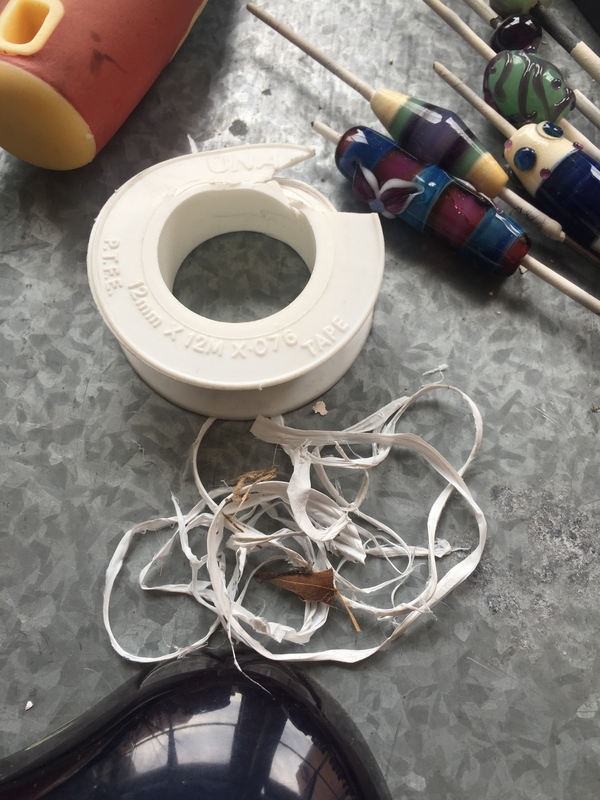 However, plumbers tape is plastic and is subject to degradation and the reason for why artists do not recommend that you use it is because of the urban legend that the degrading plastic can get into your gas or oxygen line and get stuck in your torch, effectively clogging it up. Yes, this can happen IF you don’t wind the tape on properly and IF you do not check it every so often. Like anything when it comes to equipment you should be looking at it every few months to see if its still in good working order and connections sealed with plumber’s tape are no different. I have used plumbers tape for years on my connections and I have developed some good habits around using it which is why I support the use of it. So I’ll list what I do and you can refer to the photographs for a clearer picture of how I do it, following these steps will ensure successful connection without any dramas. A fresh wind of plumbers tape, notice how it is not wound right to the very end. This will stop any frayed bits breaking loose. 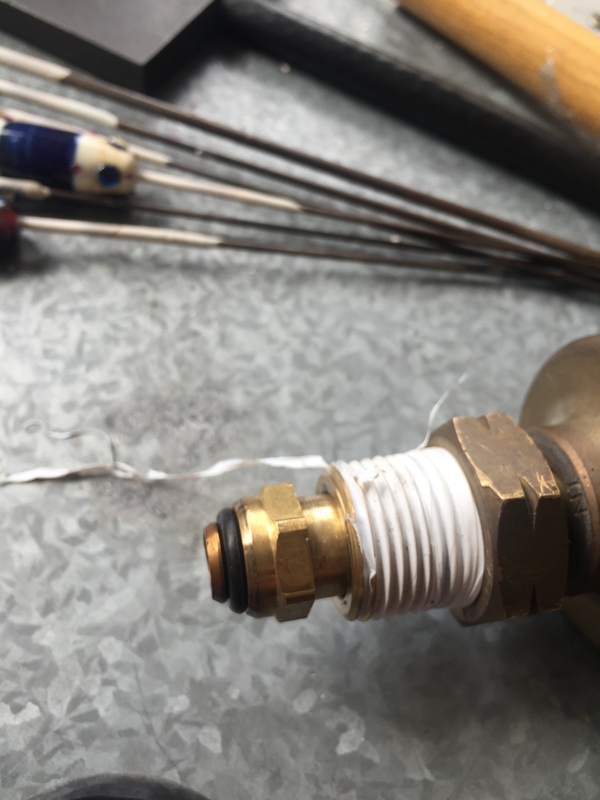 A gas bottle thread connects all the way to the top and is unlikely to leave any tape exposed where it can fray. 1. When you wind plumbers tape on, make sure it is only on the thread of your gas or oxygen bottle. 2. Do not “double wrap” the thread, use only enough to go around once and to seal the tape down. Do this with your thumb and gently push the tape into the grooves so it “sticks”. 3. Never wind tape right to the end of the thread, always finish the wind with an edge of thread exposed where it is closest to the nozzle. 4. Keep your connections secure, if you are unscrewing them a lot, the tape will degrade quicker. 5. Every time you disconnect your regulator from your oxygen or gas bottle and flashback arrestor from your regulator, replace the tape. New plumbers tape on both the arrestor and the regulator. The arrestor doesn’t wind all the way to the top of the thread. I check this tape about once a year, since my gas bottle lives inside. If your bottle is outside, check the flashback connection more regularly. 6. If you use tape between your torch and your hoses, keep an eye on the connection. This is less likely to degrade (I’ve replaced the tape only twice in 9 years) but it can still happen at that point as well, particularly if you lean up against the torch or hoses a lot at that point. Plumbers tape is fine to use as long as you maintain it and ensure that it is not fraying. It will save your thread connections and help ensure that the connection is tight and not leaking from anywhere. If you do not maintain it, there is the possibility that a fragment can break off and work its way through your pipes and into your torch. A good rule of thumb is to replace the tape every time you change your bottles over. 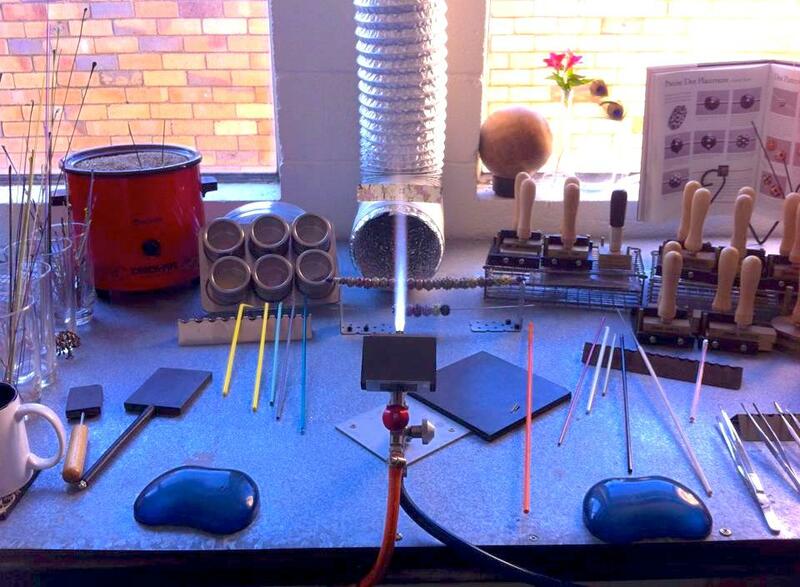 Now, you’re ready to play with fire and glass… but only if you have some mandrels prepared! The little man has had quite a time, lots of teeny tiny tombstones emerging from his gums. It’s odd having a baby with no teeth and suddenly a mouth full of them. Not a lot on the sleep front from him and I don’t have the energy to do anything, although I have a lot of clearing, sorting and donating clothes to do. Oh well. I’ll get to it.